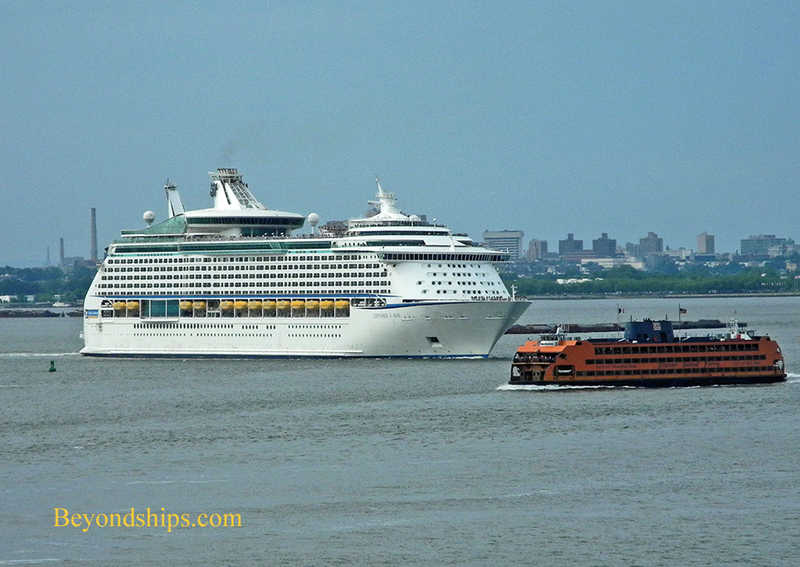 Explorer of the Seas encounters the Staten Island Ferry. 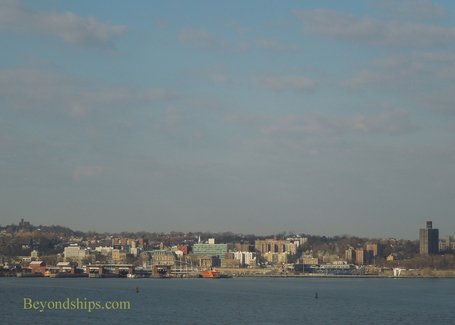 As your ship leaves lower Manhattan, you are entering Upper New York Bay. Very quickly, Governors Island appears on the port side of the ship. This 172 acre island is legally part of the Borough of Manhattan even though it has no physical connection to Manhattan Island. 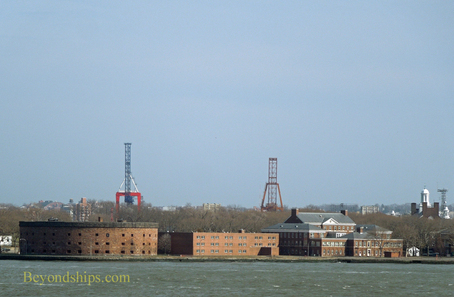 Given its strategic location, for much of its history, Governors Island was an Army base. Later, it was the regional headquarters of the U.S. Coast Guard. Most of the buildings on the island date from this period. Indeed, Castle Williams, the round fortress on the northwest shore, dates from 1807. It along with the island's Fort Jay are now part of a U.S. National Monument. Most of the remainder of the island is being developed as a park by the City of New York. 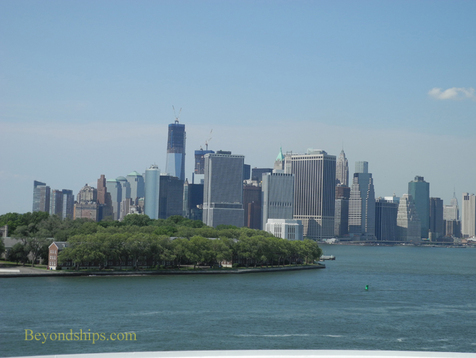 If you look back toward the tip of Manhattan, you can see up the East River, which separates Manhattan from Brooklyn. 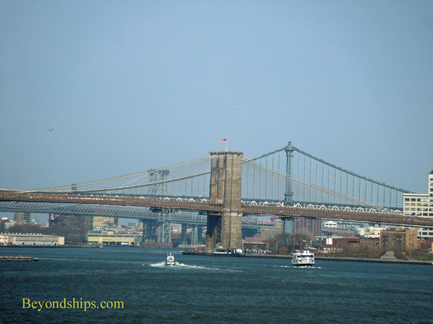 The bridge closest to you is the Brooklyn Bridge. Considered an engineering marvel, the 1,596 foot span was completed in 1883. It has been sold numerous times but never by its owner. 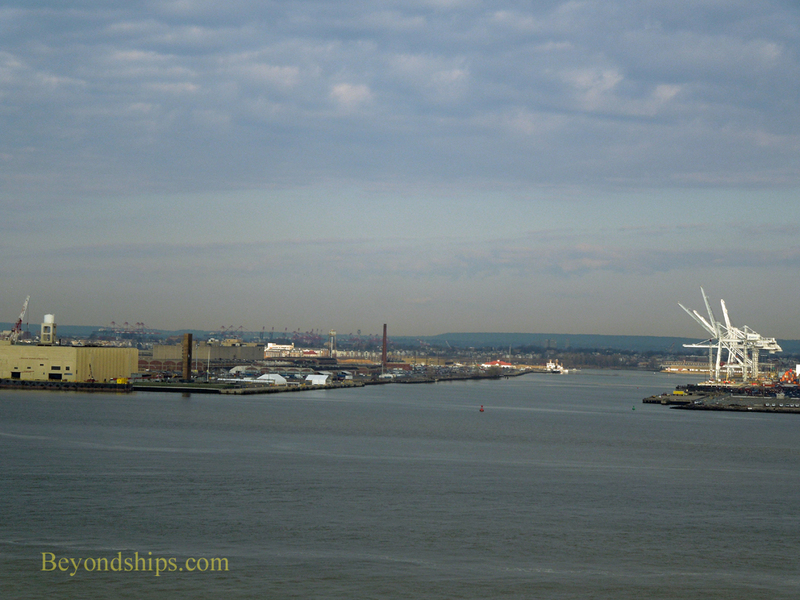 Across Buttermilk Channel from Governors Island is the Brooklyn Cruise Terminal. Ships sailing from here sail by the southern shore of Governor's Island and then turn to port joining the same shipping channel that is used by ships sailing from Manhattan. 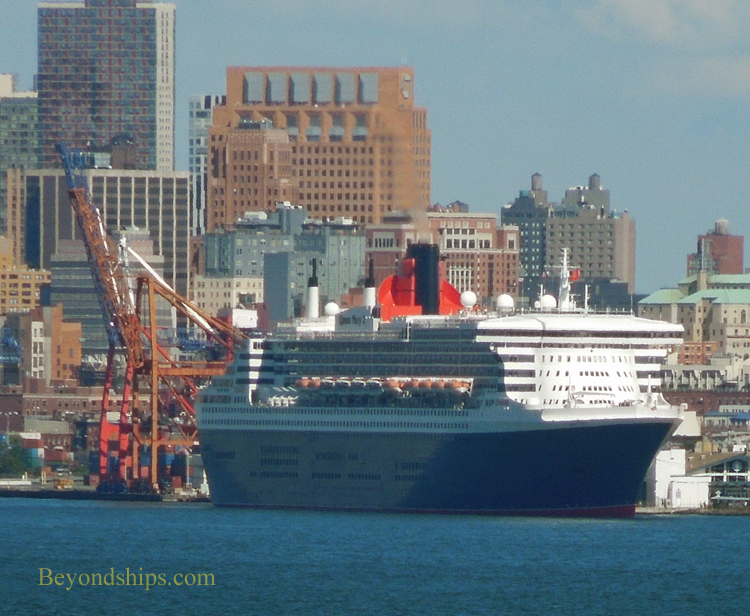 Above left: Queen Mary 2 at the Brooklyn Cruise Terminal. 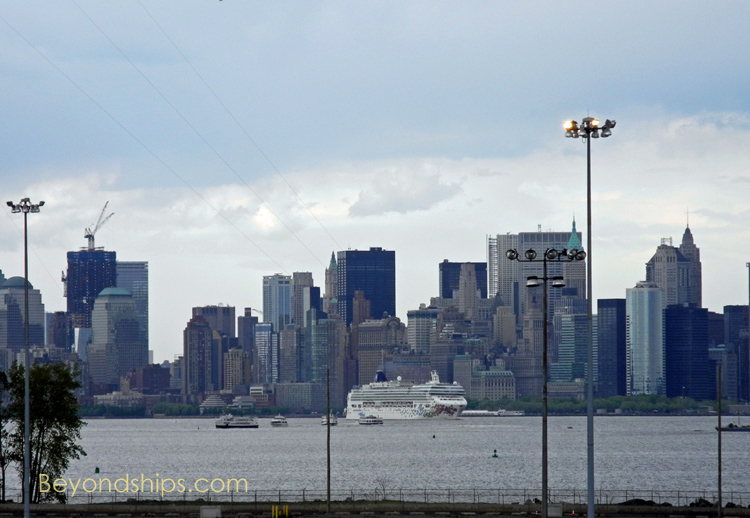 Above: The view of Manhattan from a ship at the Brooklyn Cruise Terminal. Do not linger on the port side because some major sights are now appearing on the starboard side. 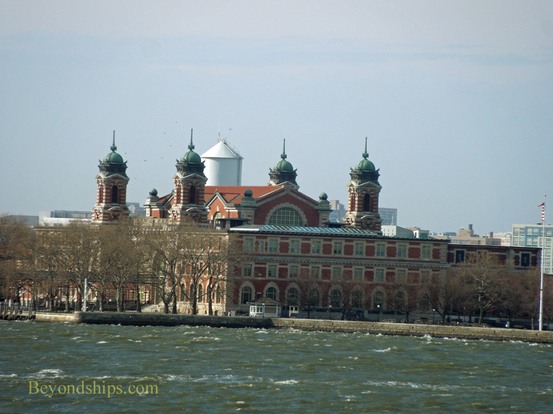 Ellis Island is known as the "Gateway to America." It is estimated that half of all Americans have at least one ancestor who entered the United States through the immigration station at Ellis Island. The station closed in 1954 and the buildings were left to deteriorate. However, in 1965 it was made part of the Statue of Liberty National Monument. In 1990, an immigration museum was opened in some of the restored buildings. However, in 2012, the island suffered severe damage from Hurricane Sandy. 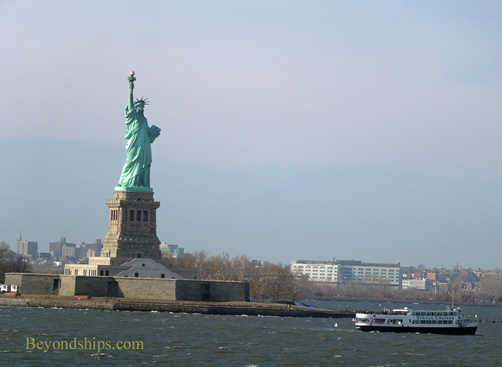 One of the great highlights of a cruise through New York Harbor is the Statue of Liberty. The idea of creating a monument to freedom and democracy in the United States is credited to Edouard de Laboulaye, a French thinker who was an admirer of U.S. President Abraham Lincoln. In 1875, Laboulaye proposed that the people of France would build and finance such a statue and the people of the United States build and finance the pedestal. 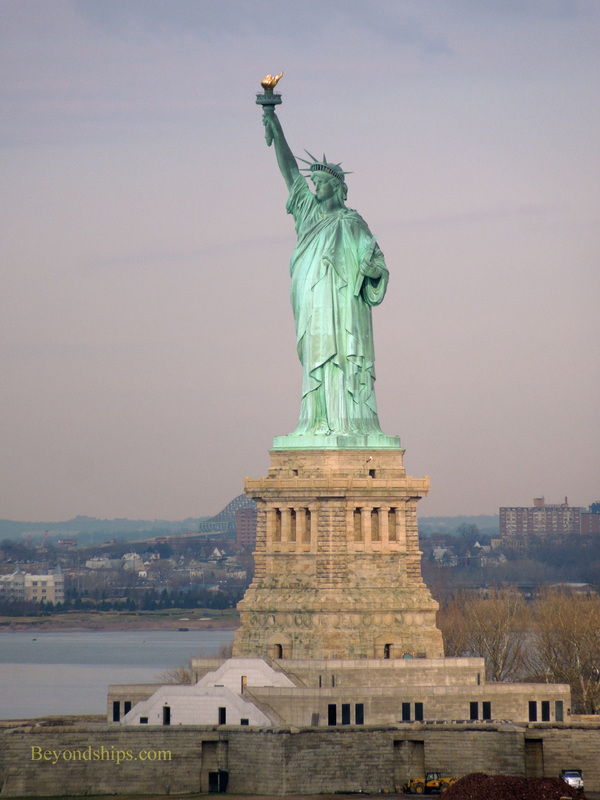 The idea impressed French sculptor Auguste Bartholdi who designed the statue using his mother as a model. Bartholdi also came to the United States and selected the site for the monument - - atop the star-shaped Fort Wood on Bedoe's Island in New York harbor. In addition, he helped Laboulaye raise 400,000 francs for the project. The construction of such a monumental statue also required an architect and after the death of the first man selected for this post, Alexandre Gustave Eiffel was selected. The future designer of the Eiffel Tower, used a modern system that attached the copper skin of the statue to an iron interior framework. The statue was constructed in France and then taken apart for shipment to the United States. Surprisingly, enthusiasm for the project initially was not as great in the U.S. as in France. The U.S. was experiencing an economic depression and it was difficult to find backers for this "foreign" project. Indeed, a bill to allocate $50,000 for the project was vetoed by then New York governor Grover Cleveland. Well-known architect Richard Morris Hunt who had been hired to design the pedestal donated his salary to the project. However, what changed the public's attitude toward the project was a grassroots campaign by publisher Joesph Pulitzer's New York World, which raised $120,000 dollars from average Americans. The project was completed and the statue was dedicated in 1886 in a mammoth celebration led by now U.S. President Grover Cleveland. The Statue underwent a major restoration in the 1980s and was re-opened in 1986 in a spectacular ceremony led by U.S. President Ronald Reagan. A U.S. National Monument, the Statue is operated by the U.S. National Park Service. Following the attacks of September 11, 2001, the Statue was closed for a time for security reasons. The grounds of the monument re-opened in 2004 and the Statue itself in 2009. However, Hurricane Sandy in 2012 caused damage forcing the closure of the monument for an extended period. After passing the Statue of Liberty but before reaching Staten Island, your ship will pass Cape Liberty Cruise Port in Bayonne, New Jersey. This is a former military site from which thousands of troops embarked to fight in World War I and World War II. On the northeast tip of this area is a towering monument donated by Russia in memory of the victims of the 9/11 attacks. Ships leaving Cape Liberty turn to starboard and then follow the same channel that is used used by ships sailing from Manhattan and Brooklyn. 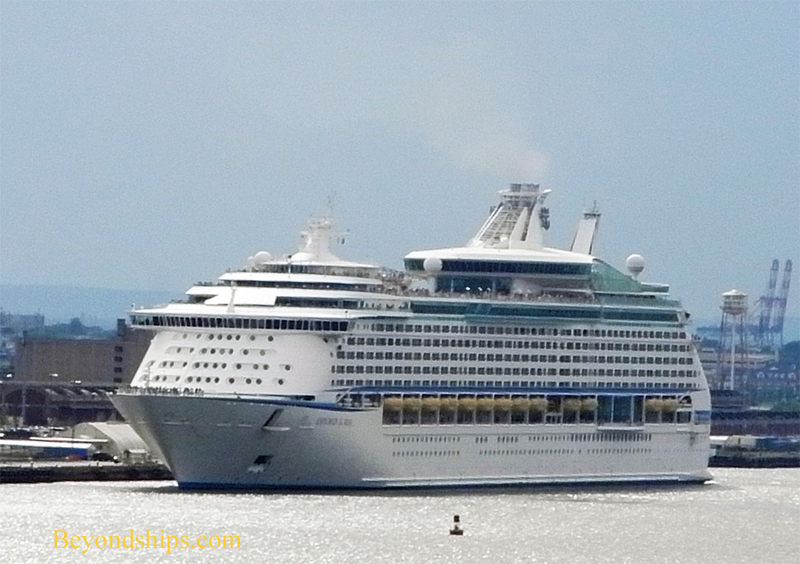 Top: Explorer of the Seas leaving Cape Liberty. Bottom: A view of Manhattan from a ship at Cape Liberty. The cruise ship in the photo is Norwegian Gem. 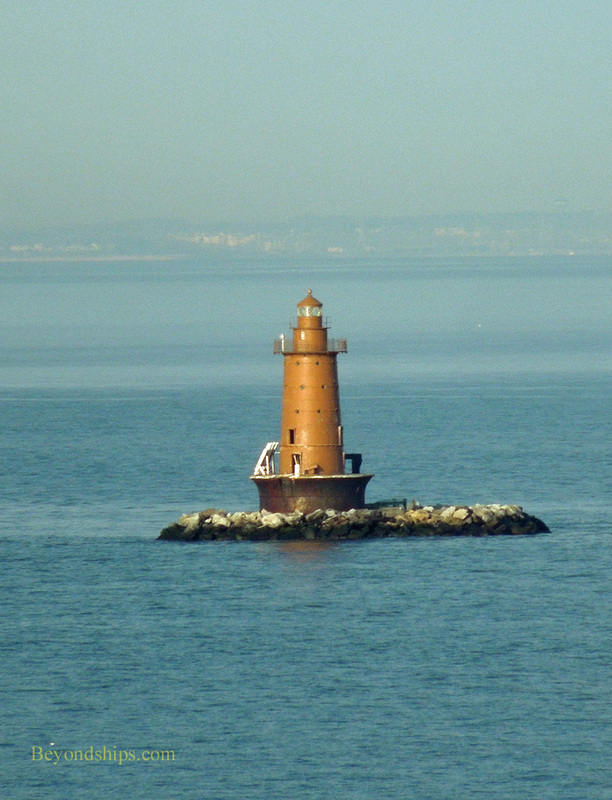 Next, the ship will pass along the eastern shore of Staten Island. The most suburban of the New York City boroughs, Staten Island has a number of distinct communities. The developed community at the northeast corner is St. George (right). Moving further along the shore, you come to a long modern pier that projects out toward the shipping channel. This is the Homeport Pier at Stapleton that was built for the battleship U.S.S. Iowa (BB 61) and her task group when Iowa was re-commissioned in the 1980s. 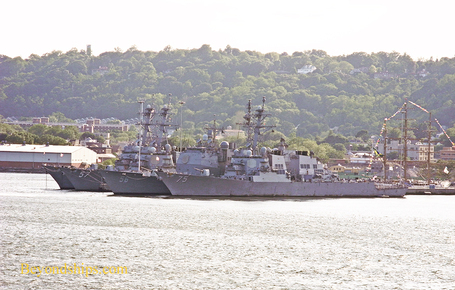 Iowa, however, was never based here and the Navy only uses the pier on rare occasions such as the annual Fleet Week. Meanwhile on the port side, the ship is passing the coast of Brooklyn. 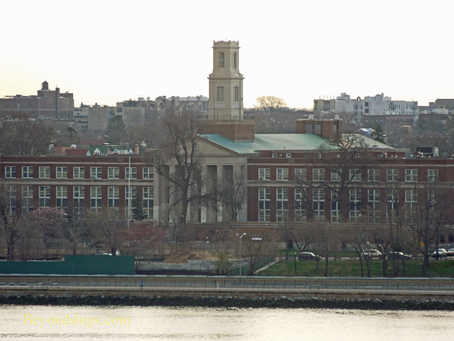 Perhaps the most impressive building along this stretch is Fort Hamilton High School. 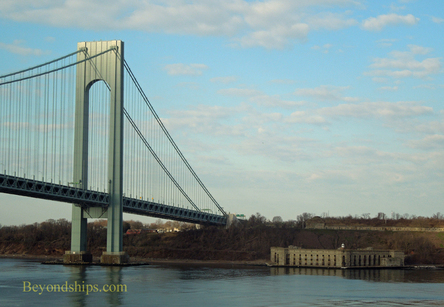 Standing like a gateway, the Verrazano-Narrows Bridge separates Upper New York Bay from Lower New York Bay. The bridge first opened in 1969 and connects Brooklyn with Staten Island. The center span is 4,260 feet long. Fort Wadsworth. Until its closure in 1994, this was the oldest military installation in continuous use in the United States. The fortress we see today was completed during the American Civil War. Today, the area is administered by the National Parks Service and is part of the Gateway National Recreation Area. 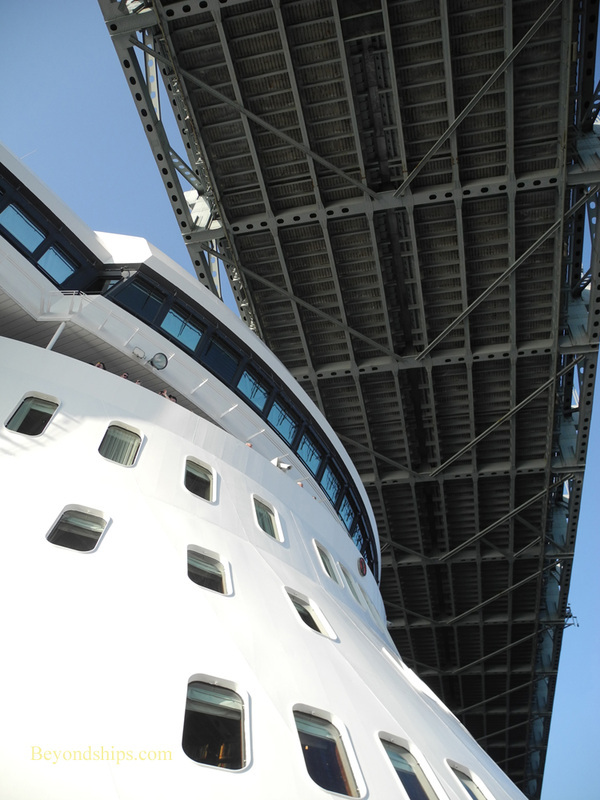 As cruise ships have grown in size, the distance between the bottom of the bridge and the top of the cruise ships passing under the bridge has declined. Queen Mary 2, for example, only clears the bridge by some 12 feet. 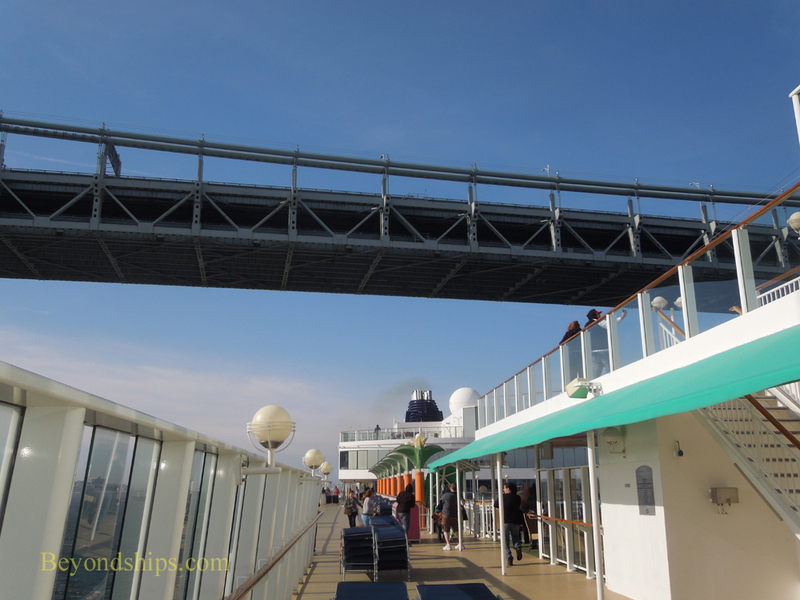 Even on smaller cruise ships, a popular thing to do is to watch the mast and/or the funnel pass under the bridge. It always looks like they won't make it but, at least thus far, they always do. Left: Queen Mary 2 squeezing under the bridge. Above: The view from Norwegian Jewel's upper deck passing beneath the Verranzano. After passing under the Verranzano, the Lower Bay is somewhat anticlimactic. Off to port, you can see Coney Island in the distance. Actually, a peninsula, Coney Island was popular for its amusement park and beach in the first half of the 20th century. The tall red tower is a defunct amusement park attraction, the Parachute Jump, which has been preserved in tribute to those times. The Lower Bay is sprinkled with a number of small islands. Some of these serve as aids to navigation but many are simply desolate. Eventually, your ship will be met by a pilot boat and the pilot who has advised the captain as the ship sailed through New York Harbor will depart. The ship is now at sea.